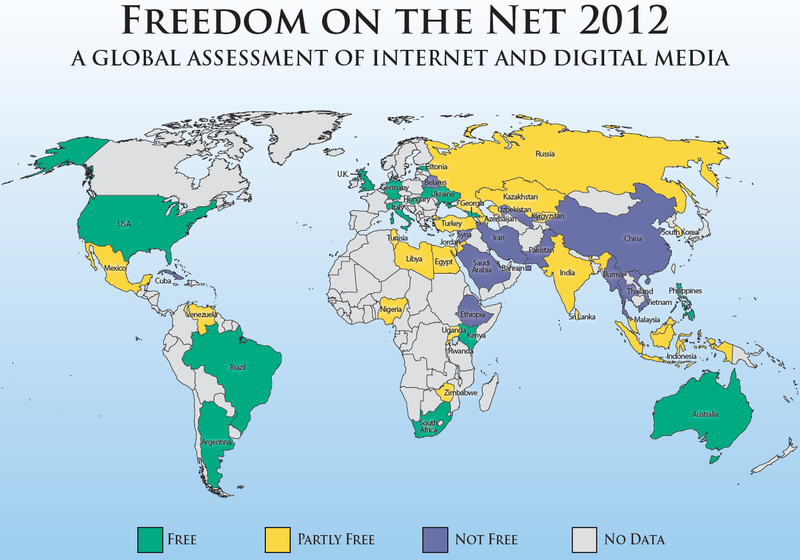 Freedom House's annual report Freedom on the Net 2012 is out. 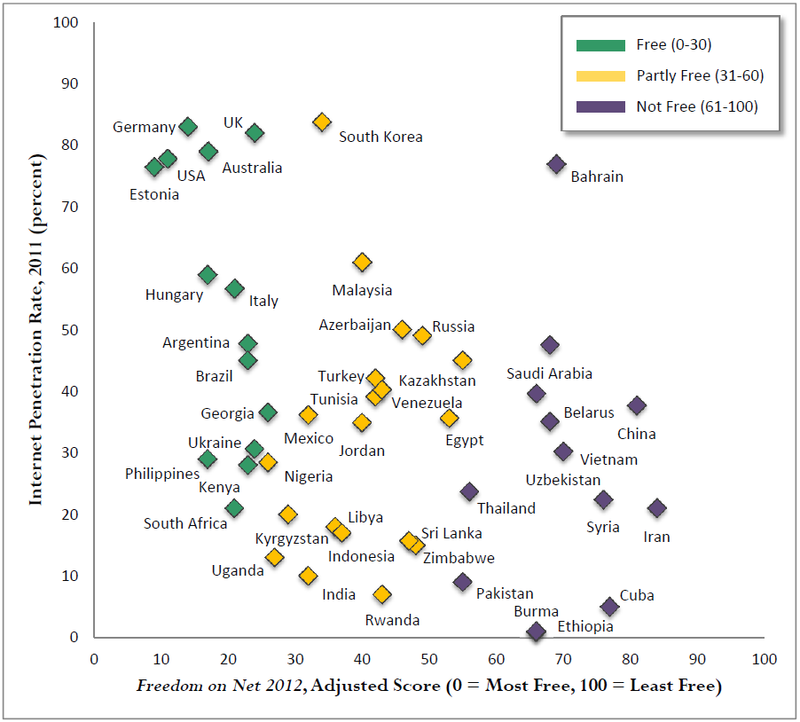 The report ranks nations on Internet freedom, which they compute as a function of obstacles to access, limits on content and violations of user rights. The Cuban country report is on pages 152-163 and Cuba ranks 46th out of the 47 nations surveyed. The following are the actions Freedom House looks for. Those marked with a (C) are practiced in Cuba. The following figures establish some context. This world map shows the nations that Freedom House rates as not free, somewhat free and free. Here we see all of the not free nations. Cuba is next to last, leading only Iran. Part of the problem in Cuba is very low Internet penetration in homes, as shown below. Bear in mind that the correlation we see here between Internet penetration and the index of freedom does not establish causality -- in fact the two variables reinforce each other. How come there is no data from Canada? And about the report from Cuba, there was indeed "Localized or nationwide ICT shut down" during the visit of the pope (internet, sms and phone calls from Cuba to outside were shut-down for about 48 hours), but maybe this happened after they collected the data. But again, that was not the first time. I don't know how they pick the nations. 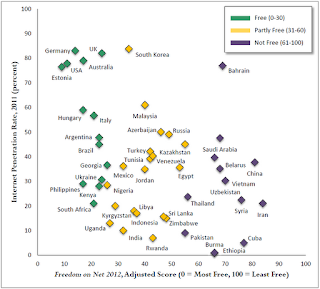 My guess is that Canada is relatively free, but that is just a guess. "Transportation was virtually paralyzed hours before the Alitalia plane landed and Internet access was cut in schools and workplaces a week in advance. The mobile phone company, Cubacel, became an accomplice, cutting the lines of any potentially "dangerous" users. Even the black market experienced anxious moments with the excessive number of police in the streets. The country was under an undeclared state of emergency." Does that sound accurate to you? Do you know if visiting Canadians have options for roaming wireless internet access (even if it is just restricted to email)? You won't have 3 or 4G service and I bet roaming calls would be pretty expensive. (Have you asked the rates from your cell provider)? Your best bet for email may be your hotel. Sorry to be so clueless -- perhaps someone else can answer. I can confirm that data roaming works in Cuba for Rogers and Fido, but I don't know about other companies. It is insanely expensive though, about 30$ CAD for 1 Mb of data.